It’s time for another week of the APAC League! Which match-ups are you most looking forward to? 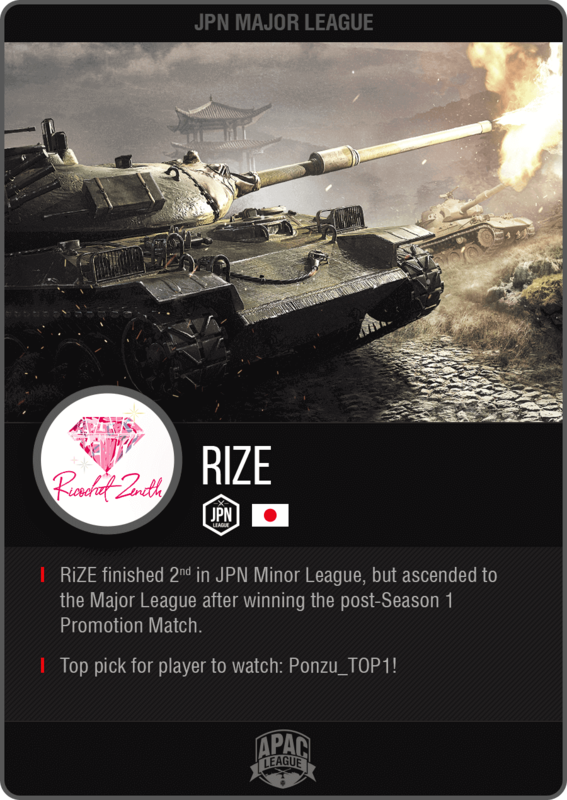 We’ve definitely got our eyes on RiZE, the newest addition to the JPN Major League. Having climbed their way up to the top of the Minor League with a considerable lead last Season, we can’t wait to see how they’ll fare against the household names and juggernauts in the Majors. Let’s find out more about them! How was your team formed? SleipPro & narasino: We created the team in January 2017 aiming to join the WoT eSports scene, and we finally made our competitive debut as Ricochet Zenith around May of the same year. It took half a year to recruit members, that’s why we officially became active during the summer. Can you tell us more about the significance of your team's name and logo? RiZE’s logo is a star ruby, the “king of gemstones”. The star ruby is said to be able to consolidate bonds and strengthen determination, which perfectly aligns with our mindset. Our new team name, RiZE, refers both to our Ricochet Zenith origins and to the English word “rise”. What inspired you to begin playing competitively? We usually watch streams by EU and RU WGL players. Our goal is to get closer to their level, and that’s why we are enjoying team battles. How do you feel about finally entering the JPN Major League? We finished last in the Japan Silver Invitational League, and it was really frustrating. We started working on our tactics and individual skill, and that’s how we managed to win the Promotion Match. We won’t lose anymore. With this determination, we aim to go even further. Are there any APAC League teams you especially look forward to meeting on the battlefield? We really want to fight against Naughty Kids. They're the team we train the most with, and the artist who made Naughty Kids' logo was also the one who made our original logo. It feels like they’re our elder brother. Catch them on social media!